The Right Golfclubs for You? "Golf Club Technology Explains it All"
Have you ever wondered why you can hit one golfclub well and not another? Why that store bought golf club just doesn't seem to be what it is made out to be? What really is in a club and is there any golf club technology in it? Why does one shaft feel different than another? Believe it or not there is a lot of golf club technology in your clubs. Our website is designed to take the mystery out of the technology that goes into golf clubs: whether it is in the heads of drivers, fairway woods, hybrids, irons, wedges, putters or in the golf shaft that powers that head. 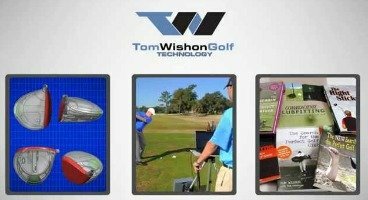 All of this ties into custom golf club technology and fitting and having the right equipment, or that which is best for you--" Equipment that has been custom fit to you by your custom club maker." ABOUT GOLF COMPANIES AND IS THERE ANY GOLF CLUB TECHNOLOGY THERE? All golf club companies sell their clubs to millions of golfers through retail golf outlets and websites. The top five golf equipment manufacturers now control about 80 percent of the premium golf equipment market with combined annual revenues of over $3 billion. Four out of five of these companies are publicly traded, and each one’s sole purpose is to grow their revenue, profits, in order to satisfy their shareholders and increase their stock price. The only way these O.E.M. 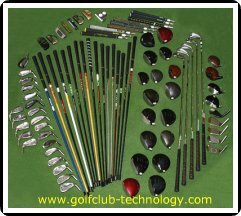 golf companies can sell the volume of golf clubs they must to satisfy their shareholders is to pre-build all their clubs to a series of standard specifications, not much golf club technology there, so they can be shipped to the thousands of retailers to be put on display and sold off the rack. Demand is driven by massive marketing campaigns and their credibility is established by paying professional golfers to play their equipment. Usually reaching into the millions of dollars, they must recoup this in their mark ups. Most retailers are selling the same exact products, so consumers hunt for the best price. Retailers have to discount to get the sale, which results in them making less profit. Making less profit means they do not have the money to hire and retain quality sales people. And retailers can’t afford to allow the sales staff to take more than a few minutes to make each sale, because making money requires that they sell a high volume of products. All they want to hear is that noise at the cash register when your credit card is swiped. Drivers and woods have been produced far too long for the average golf to hit consistently, and have you ever checked the loft imprinted on the heads? These companies have been decreasing their lofts on irons, as a way of impressing golfers with more distance. This comes at the expense of golfer’s not being able to hit their mid and long irons as well they used to, and has led to the explosion in hybrids, which translates in to more club sales. Mass produced shafts at the cheapest possible price, rumor has it they cost the companies about a $1.50 each, with no industry standards for flexes, no real basis for putting them in their heads properly (spining), except to feature their company graphics, leaves the average golfer with a shaft not even close to what he needs for his swing. Launch monitors are placed in golf retail outlets to give golfers the impression they are being properly fit for their clubs. Yet little or no training exists to teach sales people how to properly turn the outputs of the launch monitors into the best prescription for clubs for the golfer. Retailers also have inventory to worry about, so it is very common for them to pay a special extra commission to their sales staff to get them to sell the equipment that they need to clear out fast. Add it all up, and it’s no wonder that golfers are confused and often end up with the wrong equipment. In truth, the best solution for golfers is to return to the original business model for golf equipment sales prior to the early 1900s, back when the only place a golfer could buy a set of golfclubs was to go see a club maker. Back then, golfers visited the club maker’s shop, where the clubs were built one club at a time, one set at a time, for one golfer at a time. Click on the image below to hear a real good few minutes on Tom Wishon's stand on dealing with O.E.M. golf companies. I can't sum it up any better than this.